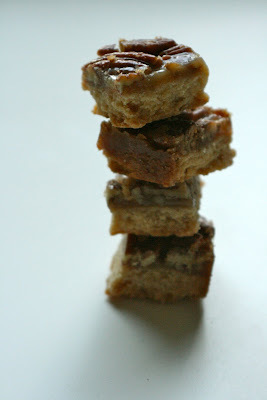 Pecan Bars / Hey, EEP! Memorial Day Weekend, wahoo! I'm going home to visit my Mama and I wanted to make her something special, just to let her know that I'm think' about her. With all of the fresh produce at the farmer's market this week, it was tempting to craft a gorgeous fruit pie or strawberry cobbler. Nevertheless, a post on The Kitchn earlier this week displayed these killer Pecan Bars and I thought of Mama immediately. JMJ does she loves pecans. The recipe comes from Every Last Cookie, a fantastic blog if you're looking for something new & sweet to make. Every Last Cookie has nothing but rave reviews for these bar cookies. So what if they're nutty. Pecans are a year round thing in our house. There's no use waiting for fall. The recipe was scrumptious, just as Every Last Cookie described. Next time I might add a little cinnamon but other than that this recipe is buttery, sweet and utterly delicious. Check out the original recipe here, or just follow along below. Press dough about 1/4-inch thick into a 9-by-13-by-1-inch baking pan. Prick the pastry with the tines of a fork. Chill until firm, about 20 minutes. Bake until golden brown, 18 to 20 minutes. Transfer pan to a wire rack to cool completely. Pour filling onto the cooled crust. Bake until filling bubbles, 15 to 20 minutes. Carefully transfer pan to a wire rack to cool completely. Run a paring knife around edges of the pan, and invert onto cooling rack, leaving the pastry on the rack. Invert rack with pastry onto a cutting board, leaving the pastry on the board, filling side up. Use a sharp knife to cut into 1-by-3-inch bars. Store in an airtight container up to 1 week. Glad these were such a hit for you! And adding cinnamon definitely sounds like a winning idea.